Not every pet has to be memorialized. Not every pet is mourned exactly equally... not when you keep chicken flocks, and make-believe to be a farmer. We see many losses. We feel them, each, keenly, but some losses go a bit deeper, hurt more. 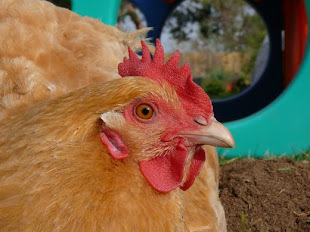 Kamen, hatched in the middle of a robotics event, has always been a stand-out hen, a survivor, a chica who crowed! I loved her very much. She was the only black chick that hatched. All the rest were grey. And we knew it was because of all the eggs that our white Silky, Zelda, hatched, this one egg actually belonged to our black Silky, Puff. And shoot... looking through the archives, connecting the dots, I find myself recalling all kinds of dear pets, and moments, like Flopsy Bunny meeting Puff. And it's so sad, and my heart feels really quite miserable. And then I just want to cry and cry, because this is just one more thing, and suddenly it's really hard to be rational, and brave, and mature and not simply lose my %&*!. Kamen and Zelda, who hatched her, and all of her Mini-Bot siblings. Kamen, one week old. And Maria! So small, and Max, too. Where is the time going? And that's another thing, when you want to memorialize a chicken, you start thinking back, and noticing the passages not only of pets, but of time, too. And then there's more feels, and sighs, and tears. So, I try to get a grip on myself and keep some perspective, but who am I kidding? I am already an emotional wreck. Kamen, you were the heartiest chicken I have ever known. You battled a bobcat, and against all odds you won! You were top of the pecking order in your life time, you laid eggs all last winter, and made a rooster know his place. You made the sun rise with your crowing. You were a brave, resilient, one of a kind darling. I will miss you. We will all miss you. I happen to have a friend, a Chicken Sister, I'll say affectionally, because she understands. She knows. And just by chance, and mostly because Robin has an uncanny gift for generosity and kindness, last night she sent over these two mugs. At the time, I was only sure that Kamen was having a bad spell, and so was I, and then the mugs came, and it was just so... so Robin. It's about the thoughtfulness, and the sort of cosmic timing. A token of affection, that's deeply appreciated. It's so sweet and funny, and it's really touching when a friend knows you. And for some reason all of this helps, today, too... because even if it might be a bit much, over the top, to mourn a chicken, to link archives, and edit old photos, for the sake of a bird, I take comfort in knowing that Robin, and many others, will understand my chicken memorial, my weepy emotions. I feel cared for and connected. And it really helps to let it all out, and I like knowing that I know a lot of people who will care, and understand, too. Kamen, I think you and I, both, have been lucky chicas! Kamen told, and will always tell, a particularly meaningful, and wonderful, story within the Bird House story. Indeed a survivor, a rugged individual, a connection to a life that in so many ways is representative. Forever beloved. It's been too long since I've visited the Bird House and all of you here. And just in time for this memorial to your beloved Kamen. Yes, time whooshes by and aren't we glad for the photos in our computers and memories in our hearts? Sorry about Kamen. She was so spirited! Thank you, all. Your kind words are sweet, and soothing.